Can you believe what a surprisingly mild winter we just experienced here in Kentucky? It has been exciting for me to see the incredibly beautiful color bursting out in the landscaping and experience life returning across the state from Paducah to Pikeville. What a reminder our beautiful state has so many seasonal differences to look forward to each year. The KAA is no different from our weather. Each year it changes and brings new and better things our way. The KAA Chapter newsletter you are about to read is meant to be a reflection of what is happening throughout our Chapter and our industry. As your new KAA president, I am proud to announce there are even more opportunities for our membership than ever before. Our training opportunities continue to increase through the addition of programs like the "Chipper Operator Specialist Workshop" and multiple offerings of the "ISA Tree Risk Assessment Qualifications" program. We have also continued improvements through our annual events such as the KAA Tree Climbing Championship (October 15, 2016) and the KAA Annual Conference (October 20 & 21, 2016). Did you know the Annual Conference alone, has nearly doubled in size since I became a member in the organization in 2011? Our best conference yet (2015) served over 130 arborists and tree workers. That's incredible! Please enjoy this issue of the KAA Newsletter and all that it shares. And, as always, if you find articles that you feel would be beneficial to our membership please don't hesitate to share them with us. We always need your help to make our this newsletter and our KAA better! Along with the highly destructive Emerald Ash Borer (EAB)—an insect from Asia imported into the U.S.A. most likely via wooden pallets—North American trees are now in danger from another destructive and imported Asian insect, the Asian Long-Horned Beetle (ALHB). This insect, however, may prove to be more destructive than EAB because it has a much wider palette of trees it attacks. The EAB is very species specific in that it attacks and kills Ash trees only*. ALHB is known to enjoy feeding on Ash, Birch, Elm, Goldenraintree, London planetree and Sycamore, Maple, Horsechestnut and Buckeye, the Katsura, Mimosa, Mountain Ash, Poplar, and Willow trees. This group of trees makes up a large percentage of Kentuckiana’s tree canopy. ALHB adults are large—1”-1.5” long, with long antennae and six legs. 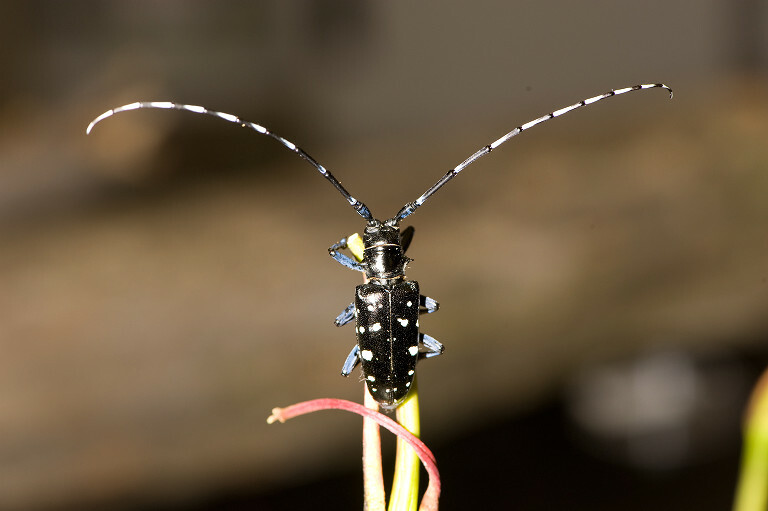 The adults’ bodies are shiny black, with irregular white spots, and their antennae sport black-and-white bands. All of the life stages of the ALHB can survive our winters, which enables the adults to emerge out of the trees at different times of the year. Most adult activity occurs in the Summer and early Fall, but they have been seen in early Spring and early Winter, too. This characteristic alone makes it hard to time treatments to eradicate. When the female lays her egg in a tree, she inserts it under the bark. In two weeks, the egg hatches and the larva burrows its way into the cambium. As the larva grows, it continues to burrow deeper into the tree and eventually settles into the tree’s heartwood, where it continues to feed on the tree and develop. The larval stage can last nearly a year and in that interim the larvae continue to grow and molt through as many as 13 growth phases. A good indicator of larvae in a tree is the frass that accumulates at the base of the tree and on the trunk. Once the larvae reach a tree’s heartwood, there is no insecticide treatment that will effectively rid an infected tree of the insect. This, and the ALHB’s ability to continue to grow and survive through our Winters, makes complete eradication of the insect a necessity, in order to protect and save our tree canopy. In Clermont County, Ohio; Worcester County, Massachusetts; and the Kings, Queens, and Nassau/Suffolk Counties in New York, ALHB has been detected. These three states have initiated an eradication and quarantine program that has, so far, been successful in halting the insect’s progress. It has come at a great price, though, in that the only way to insure eradication is through the removal and destruction of the infected trees and those within a set perimeter within and surrounding the infestation. Eradication is costly, both at present and in future, as these states are removing thousands of trees that will eventually need to be replaced, once the area has been deemed free of the ALHB. Loss of tree canopy means a loss of wildlife habitat, reduction in CO2 , water filtration, and cooling effect in the summer, just to name a small portion of the benefits of our tree canopy. It must be the goal of every Arborist to be aware of this insect, and to report it if it is seen. With absolute vigilance, we can halt the spread of this insect and prevent it from destroying the beauty of our existing trees. Landscaping too often focuses on the new. Every winter gardening publications highlight the up-and-coming “new and improved” tree cultivars. Glossy displays hype the virtues of these latest trees: faster growth, better color, nicer form. Nursery sales representatives at trade shows expound on the merits of their new exclusive cultivars; they are guaranteed to increase your sales! 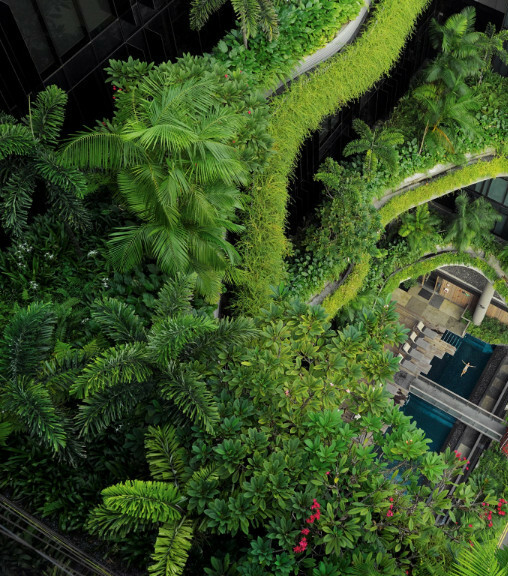 THE ROLE OF URBAN TREES – IS IT ALL TOO ANTHROPOCENTRIC? Over the last year in particular, as I have begun to really begin researching the role urban trees have, and what they are perceived to provide in the planning stages of developments, I have become increasingly concerned with the seemingly over-riding desire to use trees for the benefits of humans. Vancouver residents have been able to go online for the past week and buy trees for $10 each through a city program designed to help boost the urban tree canopy. 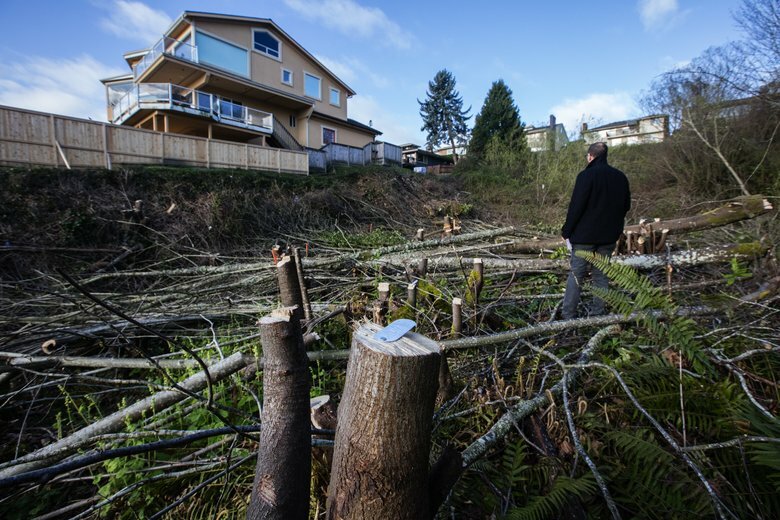 But even as residents snap up thousands of trees, the city continues to lose them to development, disease or storms such as the one that swept through Stanley Park in 2006 that leveled thousands of trees and triggered a $10-million restoration effort. And despite Vancouver’s reputation for parks and beauty, its tree canopy – which was 18 per cent when surveyed in 2013 – is lower than Toronto’s, which was estimated to be between 26 per cent and 28 per cent the same year. 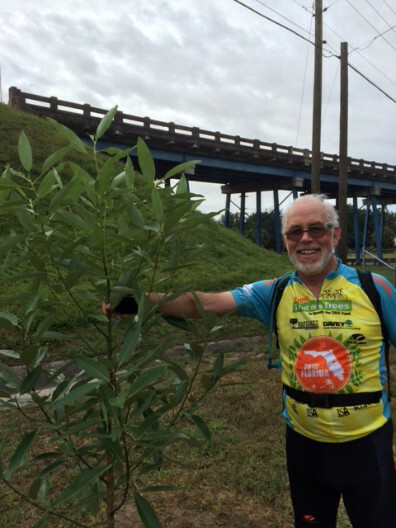 A big thanks to our very own Dave Leonard for riding in the Tree Fund's Tour des Trees and continuing to raise money for the National Tree Fund. Let's all show our support by visiting Dave's Tree Fund booth at this year's Annual Conference. Not a KAA member yet? Join today! Donating to KAA’s efforts is only a click away! 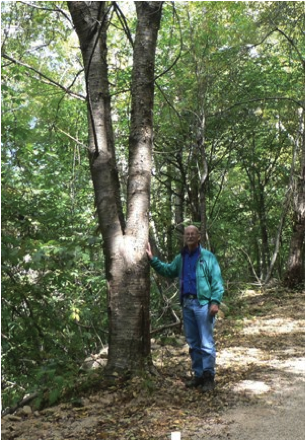 Copyright © 2016 Kentucky Arborists Association, All rights reserved.